Personalised Wedding & Christening Albums. My personalised commemorative albums are a truly unique and refreshingly new approach to photo albums making them the perfect christening, wedding or anniversary gift for anyone who likes to buy exciting innovative artefacts. 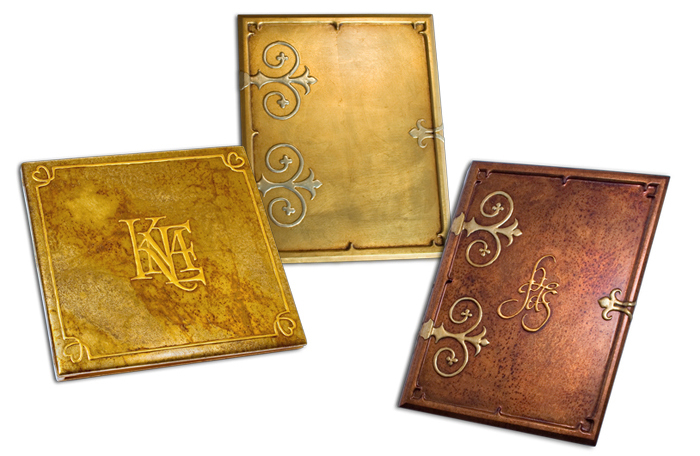 These unusual albums can be fully personalised in a wide range of ways from raised monograms, inlayed photographs or etched dedications or dates. Their beautiful gilded finishes complement the contemporary or traditional decorative styles. My photo album concept is so new I have not been able to load details of the different styles, finishes and sizes to this website. Please feel free to contact me with your requirements and I'll send you pictures of the different album styles and examples of the different means of personalisation that I'm able to offer you.